DOT&DOTE models with motor drive loading device. Motor drive loading device can achieve the high efficiency. Suitable for the tool room. Available inching loading function, this is suitable for calibration of F type and DB type wrench. For optional accessories, please refer to DOT/DOTE models. 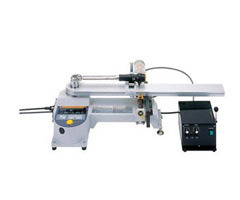 It is possible to modify DOT/DOTE to motor drive loading. BCD output is available as option.